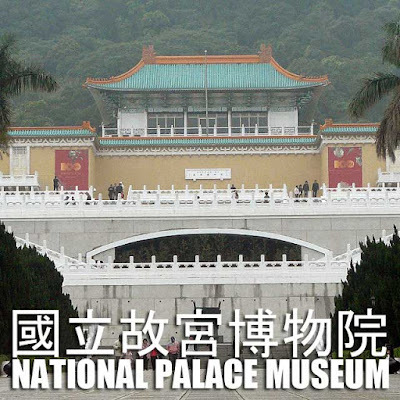 The National Palace Museum 國立故宮博物院 has the most significant collection of Chinese artifacts in the world, even bigger than the Palace Museum in Beijing. The history of the National Palace Museum in Taipei actually began in 1925 when it was established in the Forbidden City in Beijing. This explains why the word palace is included in the name rather than just National Museum. In 1931, to protect the collection from the ravages of the Sino-Japanese War, the collection was moved to the hinterlands of China. When civil war erupted between the Nationalist and Communist forces, the collection covering about 600,000 artifacts and works of art, were shipped to Taiwan. This explains why Taiwan has the better and most significant pieces of Chinese works of art and culture. Unfortunately, we could not take photos inside. But needless to say, the collection was awe-inspiring. And some pieces were so intricate and detailed, one would simply wonder how they were made. The oldest artifacts are prehistoric pottery that are over 5,000 years old. The collection includes artifacts made from jade and other precious stones, bronze, ivory, porcelain, lacquerware and enamel. There are also works of art, tapestries, priceless documents and books among many others. Today, the collection has grown to 700,000 artifacts. And for the public to see all of them, exhibits are rotated every three months. With 15,000 different items shown every month, and 60,000 every year, it would take 12 years of constant visits to the museum for you to actually see the entire collection. More photos of day 2 in Ivan About Town FB page.